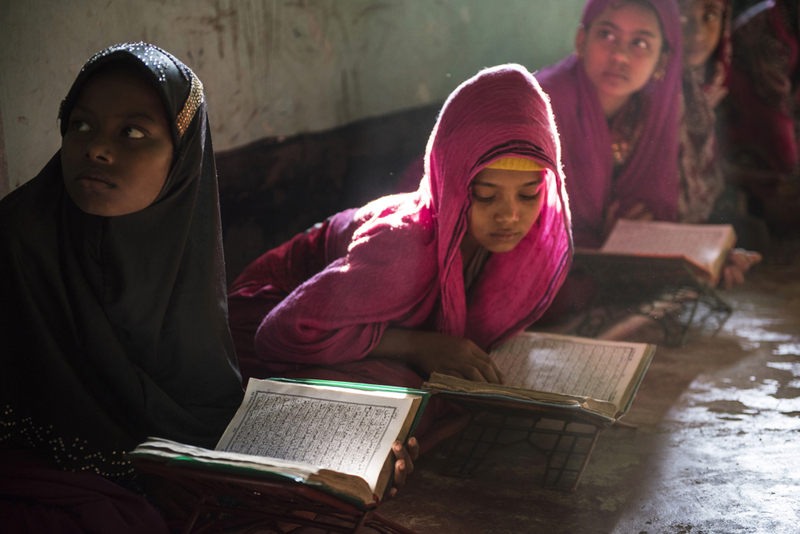 Sitara, 8, left, and Shahana, 10, right, read the Koran at a madrassa in a mosque in Shamlapur, a Rohingya settlement, outside of Cox’s bazaar, Bangladesh, January 2016. While there are very few opportunities for Rohingya children to go to school on account of a lack of teachers, books, and means, most children do study the Koran at the local madrassa with the Imam of the community. The Rohingya are systematically marginalized, and forced into formal and makeshift camps across Bangladesh and Myanmar.